Every project has a scope. Scope creep is loosely defined as a situation where the client and you agree on the deliverables as well as the overall scope of the project. Then, the client begins to expect additional deliverables without increasing budget, schedule, or timelines to completion. I can feel the bullets of sweat running down your forehead as you read! No worries. We are going to talk about 5 ways to stop scope creep and minimize the possibility of getting in over your head. Document all scope creep with existing clients. Before you can effectively address an issue, you have to understand the issue from every angle. The more information you can document about prior scope creep, the more you will begin to see trends and patterns. Create a questionnaire that addresses the trends and patterns you found while completing #1. I have numerous questionnaires for different types of projects to minimize scope creep. I see no need to share them here because they are specific to my business and my clients. There are many example questionnaires you can download online to give you a starting point for developing yours. Do not overwhelm the client with your questionnaire. If you overwhelm them with too many questions, something will slip through the cracks and pop up as scope creep later on in the project. I recommend using the concept of progressive profiling applied to gathering pertinent information from your client. Start with the basics. Have a few different conversations and build their profile as you go. This also sets the expectation with the client that you will have more of a relationship that just completing the project and moving on. It suggests that you are establishing a long-term business relationship. Outline limits in your contract. Some types of scope creep can be addressed up front in your contract with the client. Things like number of revisions, number of concept drawings, etc. can all be addressed in the contract. In addition, make sure you build in a stipulation for what happens if the client exceeds the limits. For example: If you are designing a logo and a client wants more revisions than the contract allows at the quoted price, charge them a per-revision fee after the original limit is reached. The main concept here is to get pertinent information, set proper expectations, and stand your ground in a professional way. No matter what you think, it is very bad for your business for you to constantly bend on your rules. There are isolated situations that may warrant adjusting a policy, however, it should not become a habit. If you do not stick to your guns, you will work yourself to death trying to please clients that will always feel like if they fuss, you will do more for free. You are creating a bad situation for yourself where they lose respect for you. If you politely and professionally stand your ground, it will ultimately strengthen your relationship, their respect for you, as well as the image of your company. 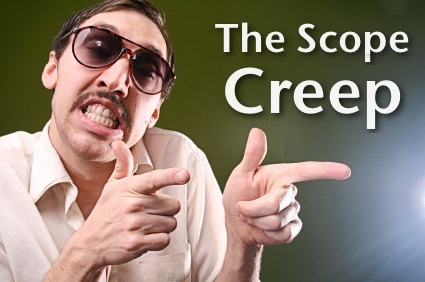 Have you ever experienced scope creep? How did you deal with it? Let me know in the comments section below!